Associate professor of education in the Department of Education at California State University at Fullerton, his areas of specialization include multicultural education and school curriculum development. He integrates post-modern educational perspectives and practices into the process of curriculum delineation. With a high level of proficiency in Tibetan, English, and Hindi, his current research focuses on culturally responsive teaching practices in schools populated by students of diverse ethnic, cultural, and linguistic backgrounds. Exiled with his family from Tibet at an early age, he now studies the challenges of educating children in the Diaspora. He is the first Tibetan educator teaching at a major teacher education university in the US. He helped organize two major events in Orange County, CA, with the gracious presence of His Holiness The Dalai Lama at the helm. He is a practicing Buddhist. 1. In your estimation, what are the practical and spiritual implications of compassion? Why is compassion such a vital component of interreligious dialogue and engagement? 2. What, for you, are the most instructive elements of the teaching of HH the Dalai Lama on compassion? Buddhism is the religious and philosophical tradition founded in India in the 6th century bce by Siddhartha Gautama, called the Buddha, or the “One who Awakened.” One of the great Asian religions, it teaches the practice of meditation and mindfulness and the observance of moral precepts. The basic doctrines include the "Four Noble Truths" taught by the Buddha: existence is suffering; the cause of suffering is desire; there is a cessation of suffering—Nirvana, or total transcendence; and there is a path leading to the end of suffering, the "Eightfold Noble Path" of right views, right aspiration, right speech, right action, right livelihood, right effort, right mindfulness, and right concentration. For Buddhists, the goal of existence is the cultivation of perfect wisdom expressed in perfect compassion. Buddhist philosophy is animated by the exploration of the implications of the interdependence of every event in the universe with every other. The tradition flourishes in Asia and has a growing influence in the modern Western world. Excellence: The clearest expression of the natural meeting of psyche and spirit; the ground of enlightenment. Meditation, visualization, and transformative spiritual experience. The most eloquent celebration of the interplay of wisdom and compassion. Jainism is the faith tradition of Jina, a religious system of India practiced by about 2 million followers. It arose in the 6th century bce in reaction against ritualism and the authority of the Vedas and was established by a succession of 24 saints, the last of whom was Vardhamana (also known as Mahavira or Jina). He preached asceticism and concern for all life as a means of escaping from the transmigration of souls—resulting from one's past actions—and of achieving nirvana. The central virtue of Jainism is ahimsa, “non-injury” to all living beings. Contem-porary Jains are known for charitable works and their eschewal of any occupation that even remotely endangers animal life. The Jain tradition is often acknowledged as the source of the most profound and passionate articulations of the urgency and beauty of non-violence. Hans Küng (the great Swiss theologian and principal author of the document, “Towards a Global Ethic,” first released at the 1993 Parliament of the World’s Religions – Chicago) puts it most clearly: There can be no peace among the nations until there is peace among the religions. No one understands that better than Marcus Braybrooke, President of the World Council of Faiths and the greatest chronicler of the long development of the global interfaith movement. How has the movement grown? What’s changed over the course of the past fifty years? And why does it matter so much in the quest for world peace? 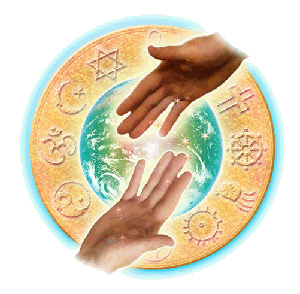 We examine the remarkable resources that the world’s religions can bring to peace work and also consider some of the most serious obstacles to interfaith harmony. We examine the notion of religious pluralism – the view that very different religions can have express equally deep truths…that more than one religion can be (indeed, must be) valid. The great Jewish thinker Martin Buber, author of I and Thou, often recalled his first experience of what he called “feeling the other side.” On a farm in the German countryside, he was brushing and currying a dapple-grey horse. As her breathing changed in response to the strokes, Buber suddenly felt as though he had changed places with the animal. Although his own arms continued their rhythmic movement, he now began to feel the currying as if he were the recipient. In a sense, he “became” the horse and shared its experience. In that moment, the vision of interfaith encounter that would shape so much of Buber’s life and work began to emerge.